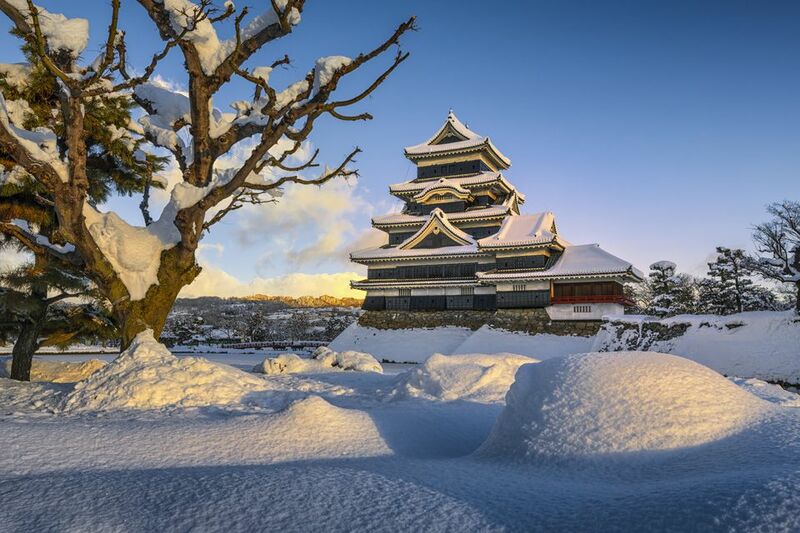 Traveling Asia in winter has some advantages: big holidays, snowy landscapes, and fewer tourists, to name just a few. Also, if you aren't a fan of cold temperatures and the depressingly nuclear-white winter sky, you'll have to get to Southeast Asia to warm up closer to the equator. Most of East Asia (China, Korea, and Japan) will be dealing with cold and snow, but the busy tourists seasons will just be gaining momentum in Thailand, Vietnam, and other warmer places further south. Additionally, although the equator slices neatly through Indonesia, though, most of Asia resides in the Northern Hemisphere, meaning that winter in this part of the world still refers to the months of December, January, and February. Although temperatures stay warm, "winter" means monsoon season in some southern destinations of Asia. Rainy days increase as seasonal rains make everything green again and put out wildfires that have sprung up in the dry autumnal season. Additionally, places such as Indonesia along the southern coast of Asia experience the most rain during December and January. Even the slow seasons in places such as Bali can be enjoyed during the winter months. Unless a tropical storm system is nearby, monsoon rains don’t typically last all day, and there will be far fewer tourists crowding the beaches. Traveling during monsoon season does present some new challenges, but travelers are often rewarded with cheaper prices for accommodation and fewer crowds. With the primary monsoon season finishing sometime around October, India begins to enjoy more sunshine, which in turn attracts more and more travelers throughout the winter season. However, the exception to this rule is in North India, where snow will blanket the Himalayas and shut down mountain passes at high elevations for much of the season, and skiing season will begin in Manali by the end of November each year as a result. What to Pack: Although the snow-covered Himalayas are beautiful, you'll need to gear up with boots and warm clothing. If you would rather stay in flip-flops, winter is a great time to get to Rajasthan—India’s desert state—to experience a ​camel safari. The beaches in the south—especially in Goa—get busy in December for the annual Christmas celebrations there, so you'll want to pack some lighter beachwear in addition to a light jacket, long- and short-sleeved shirts, and short and long pants. These countries obviously occupy a vast and geologically diverse piece of real estate, so you’ll still manage to find a few southern points with good weather in the winter; Okinawa and some of the other islands are pleasant throughout the year, but for the most part, expect wind, snow, and miserable cold throughout China—especially in mountainous regions—and Seoul, South Korea, will also be freezing. Even Yunnan in the southern part of China will still be cold enough at night (40 degrees Fahrenheit) to make shivering budget travelers squeeze around small stoves in the guesthouses. What to Pack: Since all three countries are located primarily in north- and central-east Asia, you'll need to bring enough clothes to keep you warm against the Arctic chills that blow through China, Korea, and Japan much of the winter season. Pack down jackets, gloves, a warm hat, and waterproof snow boots to avoid exposure to weather extremes. Sri Lanka, despite being a relatively small island, is unique in the way that it experiences two distinct monsoon seasons. Winter is the best time to see whales and visit the popular beaches in the south such as Unawatuna, but while the southern part of the island is dry in winter, the northern half of the island is receiving monsoon rains. Fortunately, you can take a short bus or train ride to escape the rain. What to Pack: In order to prepare for your Sri Lanka vacation, you'll need to bring a variety of clothing to shield yourself from the wet and hot weather of winter in southeastern Asia. Rain boots, a raincoat, short- and long-sleeved shirts, short and long pants, and an umbrella are all recommended for your luggage. While East Asia is mostly freezing, Southeast Asia will be basking in the sun. Winter is the perfect time to visit Thailand and other destinations before heat and humidity climb to unbearable levels in the spring. January and February are busy-but-pleasant months for visiting the region. Around March, humidity increases enough to put a sticky damper on the fun. Points farther south such as Indonesia will be dealing with rain during the winter. Peak season for islands such as the Perhentian Islands in Malaysia and Bali in Indonesia is during the summer months when rain slows. Although, Bali is such a popular destination that it stays busy throughout the year. Hanoi and Ha Long Bay—top destinations in the north of Vietnam—will still be cool in the winter. Many travelers have found themselves shivering and baffled as to how somewhere in Southeast Asia could be so cold! January is the best month to visit Angkor Wat in Cambodia, and although it will be busy, temperatures will still be tolerable until humidity gets worse and worse in March and April. Asia has plenty of exciting winter festivals, including Chinese New Year in January or February, which is one of the largest events in the world—though you certainly don't have to be in China to enjoy the festivities. Additionally, Christmas and other western holidays are observed with decorations and events, particularly in urban hubs, throughout the months of November through February, and hearing Christmas music in late October is not unusual in most East Asian cultures. Thaipusam in India: This is a chaotic spectacle that brings together more than a million Hindus at the Batu Caves near Kuala Lumpur, Malaysia. Some devotees in attendance will pierce their bodies while in a trance-like state. Setsubun Bean-Throwing Festival in Japan: Despite the cold, the country celebrates its rich agricultural heritage with this unique festival in December every year. Christmas Throughout Asia: Big cities in countries such as Korea and Japan celebrate the holiday with enthusiasm. Streets and buildings are decorated with lights, and no matter the religion in an area, there's a good chance that Christmas will be observed in some form. This is especially true in the Philippines, Asia's predominantly Roman Catholic country, and in Goa, India. Chinese New Year: Although the dates change annually, the effect Chinese New Year celebrations have on Asia do not. Although celebrations are certainly exciting, the massive migrations of people traveling to enjoy the 15-day holiday or going home to see family certainly bog down transportation. Additionally, accommodation prices often skyrocket during Chinese New Year as Chinese travelers head to all corners of Southeast Asia to enjoy warmer weather and holiday time, so plan accordingly. Western New Year's in Asia: Even countries that celebrate Chinese New Year (or Tet in Vietnam) may "double dip" and celebrate December 31 as New Year’s Eve. Shogatsu, Japanese New Year, is observed on December 31 and includes poetry, bell ringing, and traditional foods. Additionally, large numbers of Western travelers are often on the move to warm, social destinations such as Koh Phangan in Thailand to party and celebrate.